Leizia is wearing the ribbon of the Grand Cross of the Order of Charles III. Prince Nicholas of Greece was at Zarzuela. He was on the stairs for a short while talking to Felipe VI. He wasn't dressed formally so he won't be at the parlament. A lovely dress for Letizia and it seems that the ladies coordinated their outfits (all pastels/whites). It makes it seem less like an operetta and more like an event in 2014. Despite of all the things around Infanta Cristina she is the sisters has Infanta Elena so she has the same rigth of beeing there...I think it's that she should be there she is a part of the family isn't she?? I really don't think this is the right moment for her to appear at a public royal event. The new king needs to start with a clean slate, no need to have a reminder there of what made the slate dirty. 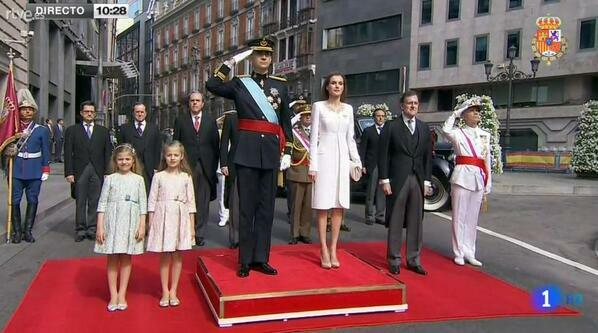 According to TVE the family of Queen Letizia is there too. I didn't see them yet on television. I supposed that they are seated in the galleries, like the family of Q. Mathilde was in the Belgian parlament. The commentator called the Infatitas very professional. I can only agree. Btw, Leonor's knows her protocol. "Viva el Rey" .. "Viva España" .."long live the King".
" King Felipe VI and Queen Letizia"
Queen Sofia was clearly very touched by the ovation. Can someone explain why the handshakes between a woman and a man is so high? Never seen that before. I love the dresses of the infantas, and queen Sofia (does she keep that title?) is such a beautiful woman! Paloma Rocasolano is also on the balcony. Also Princess Irene, who is sitting behind Infantas Pilar and Margarita. As well as King Constantine and Queen Anne-Marie.